Most people don’t normally look forward to staff meetings. But I have secretly enjoyed them at the Mattress Factory. You can learn a lot about an organization’s culture while sitting around the boardroom table. There are two main reasons why I like these meetings. First, we’re always well fed. (Very important!) Pastries and fruit and frequent birthday cakes come spilling out of the galley kitchen around the corner. Mimosas made an appearance a while back. I can’t remember the occasion. I’m sure there was one. Second, and not surprisingly, Mattress Factory staff meetings reflect the habit of creativity and collaboration that defines the museum. Of course there are the perfunctory updates on installations, future exhibitions, and numbers of tours and workshops offered. But it’s also apparent that everyone is thinking about art all the time. A few weeks ago Lindsay presented a bold, brilliant marketing idea concerning a future installation that would involve painting the entire roof. (Everyone volunteered.) This morning Nathan announced that his original orchestral composition was having its premiere in Oakland later in the week. He had tickets for sale. 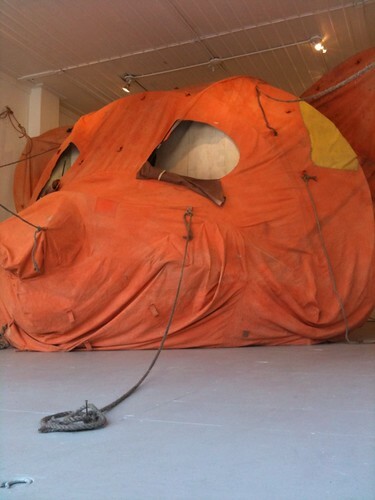 This morning's meeting also included a lively discussion about Brian Griffiths’ The Body and Ground (or Your Lovely Smile), a giant, orange, tent-like tethered bear head that fills the entire first room of the gallery at 1414 Monterey Street where Nothing is impossible opened last Friday. There have already been tours in the gallery, and there seemed to be a lack of clarity about how the piece should be interpreted by the guide. Under-caffeinated, Liz, Education Programs Coordinator, said that she struggled to get a straight answer out of Brian before the end of his two-month residency. He said one thing. The curator Georgina Jackson said something else. The tour guide seemed suspicious and wasn’t warming up to the piece. What I most loved about this conversation was how candid and honest it was. There was an implicit understanding that it was perfectly ok to have questions. That it was ok not to “get it.” Cross another silly stereotype off my list: people who work at art museums don’t always understand the art. Fancy that! It’s perfectly alright to be confused. I’m sure you can relate. But Anna, Director of Education, raised a great question: whose explanation of the piece does the museum use – the artist’s or the curator’s? Sharing and interpreting works of art is one of the fundamental missions of any art museum. If there is no clarity around this point, the museum risks misrepresenting the work and misinforming the public. In the end, the answer was “both”. Did you come to the opening? What do you think about The Body and Ground (or Your Lovely Smile)? Let us know your thoughts in the comment box below. It's that time again. We're less than two weeks out from the opening of Nothing is Impossible, the first in a series of exhibitions from our Curators-in-Residence Mark Garry and Georgina Jackson! 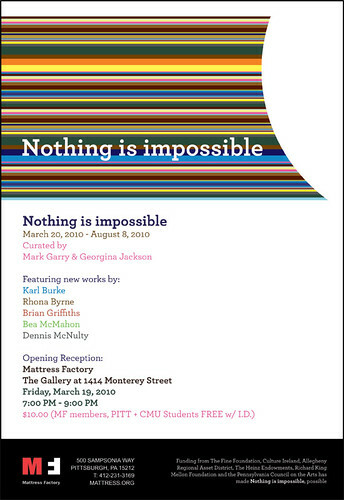 Featuring Dublin- and London-based artists Karl Burke, Rhona Byrne, Brian Griffiths, Bea McMahon and Dennis McNulty, Nothing is Impossible will open with a public reception on Friday, March 19, from 7:00 PM to 9:00 PM. If you plan to attend, you can RSVP and keep tabs on who else will be there over on FaceBook. With each new exhibition and event, we are consistently blown away by the support from our online community. And we could really use your help again! I've embedded two sizes of electronic flyers (complete with corresponding HTML code) below. Feel free to help spread the word by posting these awesome MF Shannon-designed flyers within your social networks and emailing to the art-loving friends in your contact book. Anything you can do is greatly appreciated by the artists and all of us here at the MF! I hope to see you at the opening next Friday. This past Saturday evening, the Mattress Factory’s Factory 500 members toured Millvale and Sharpsburg. 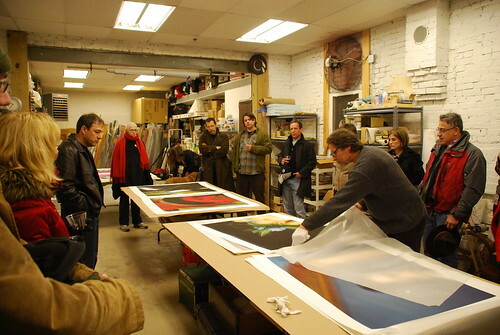 These events, specially planned for our Factory 500 and Patron level members, are amazing behind-the-scenes glimpses into the lives of creative thinkers and doers in our Pittsburgh community. 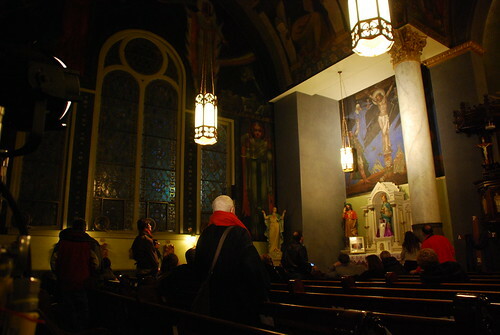 The evening began at St. Nicholas Church in Millvale. The church is home of Maxo Vanka’s famous murals (and the most amazing tour guide, Mary Petrich). After St. Nicholas we headed over to Red Star Ironworks, a blacksmithing studio chock-full of incredible custom fabricated metal designs of all shapes and sizes (including Pete Lambert’s new motorcycles!). Our next stop during our snowy stroll was Mr. Smalls Funhouse. Mr. Smalls is, well, hard to describe. It’s part concert venue, part loft apartments, part recording studio, part skate park and a million things in between. Mike Speranzo, owner of Mr. Smalls, gave us a chance to see where all the rock stars hang out before, during and after the show. I’d like to thank everyone who braved the cold and inclement weather to make it out on Saturday. It was another unforgettable event. The next Factory 500 event in July won’t be as snowy. Pinkie-swear. 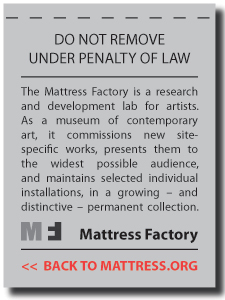 If you’re interested in becoming a member at the Factory 500 level (or any level), feel free to contact me via email at lindsay[at]mattress[dot]org or calling the museum at 412.231.3169 (and, yes, we can break down membership dues into monthly payments). P.S. Check out more photos from the evening over at the Mattress Factory's Factory 500 Flickr page.